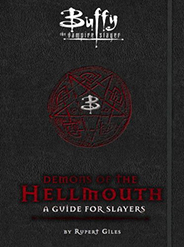 Demons of the Hellmouth is a fully licensed guide to the vampires and other demons that flocked to the Sunnydale Hellmouth in Joss Whedon’s cult TV series Buffy the Vampire Slayer. This in-universe illustrated guide is written by Rupert Giles, and also contains handwritten notes from Buffy and Willow. This unique book promises a diabolical romp through the highlights of the beloved show.